Mom got all her Christmas shopping done. 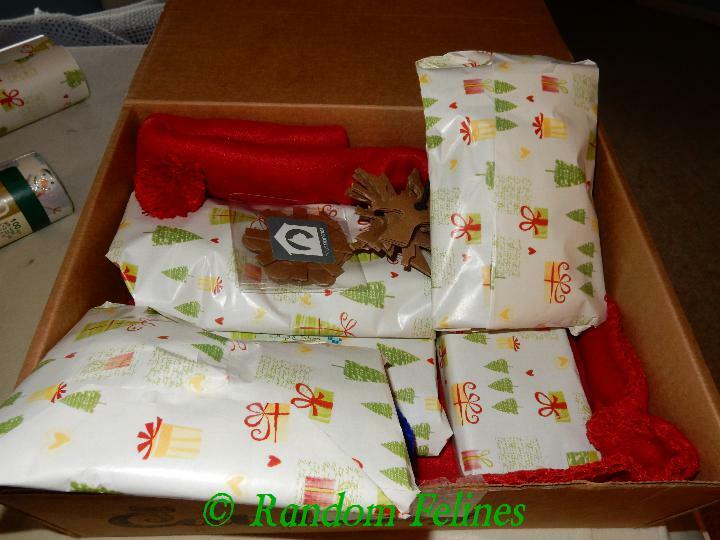 Including our Secret Paws that will go out in the mail today. Mom got some errands run and then watched some basketball. Calais climbed up on the chair and curled up with mom....all her own idea. She purred and purred. Now to work on the ninjas. MOL Mom can hold them if she catches them and they occasionally come up and look at her, but they are still a little jumpy. But they LOVE the other cats and toys. And mom broke out our new gingerbread house. 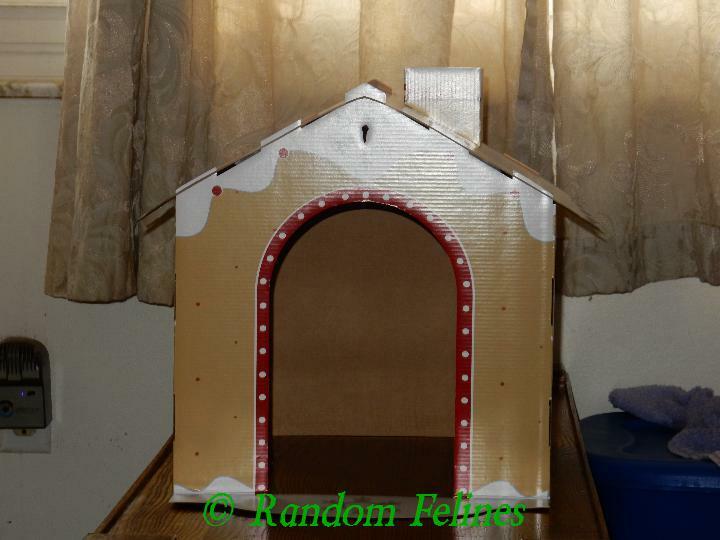 We got it as a gift from Mom Paula over at Sweet Purrfections. This one isn't being used as much as the others and mom isn't sure why, but there does tend to be someone in there a good part of the time. Thanks to mom Paula and the girls for our present (mom got it at BarkWorld). 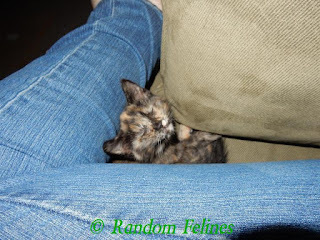 Cslais is sure cute and great that she climbed up to snuggle with you. Awwww. What cuties they are. Junior, you look quite cute inside that house! And Calais, all snuggly and adorable...squee! There always comes a moment of breakthrough. Good for Calais. I think the gingerbread house looks cool! OMC, Calais! Too adorable! We love those gingerbread houses and hope to find them around next year! Oh, Calais!!! What a sweet kit-cat! And that gingerbread house is AWESOME!!!! Calais...oh my goodness. Mom is melting over here with envy! She wants to love on Calais!! This year's gingerbread house is SO adorable! And that Calais...I could seriously snitch that little girl. How cute that Calais got up on her own for a snuggle. Gingerbread house is the best kind of house! Calais is such a lil cutie! 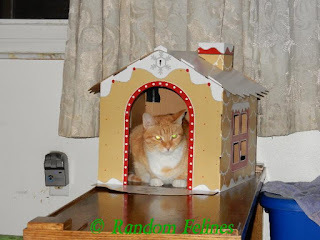 Glad at least one of the kitties likes the Gingerbread House. Would you believe that Mom Paula hasn't even put ours together?? ?